Gerri, a therapist, and Tom, a geologist, are happily married, but mildly concerned that their lawyer son is single. They don’t quite realise, either, how Mary, a fragile work colleague of Gerri’s, has come to depend on the couples’ friendship, and over the course of a year and Sunday gatherings, Mary makes a faux pas that puts a strain on the relationship. The concept of Sunday afternoons in different seasons, focusing on a happy, middle-aged couple and their friends and relations, does not seem to suggest that there’s much happening. Watching a twee film about ‘cuppas’ in the garden after sessions at the allotment, with surface dialogue that’s all about trivia, seems more like TV fodder, but this film is good, even as its also as quintessentially English as it gets. 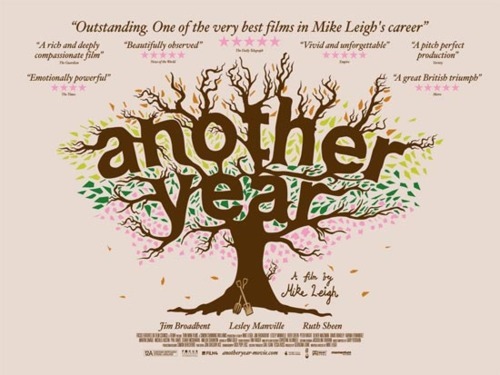 Director Mike Leigh’s method here, as with most of his films, is that it’s a sitcom set-up in a drably realistic world, using trivial dialogue and embarrassment to dig deep into the psyche: that is to say, every tiny incident, spoken line, or look, registers. Lee also always uses very good English actors, who look like the English folks you see living next door to you in the UK – real people. This film’s theme of loneliness, isolation and regret are all profound, as is its warmth.